We love cycling, and have wanted to run a bike tour for ages. So we’re very happy to have partnered up with the excellent people from Biking Buenos Aires and now run a tour on two wheels every Sunday afternoon. 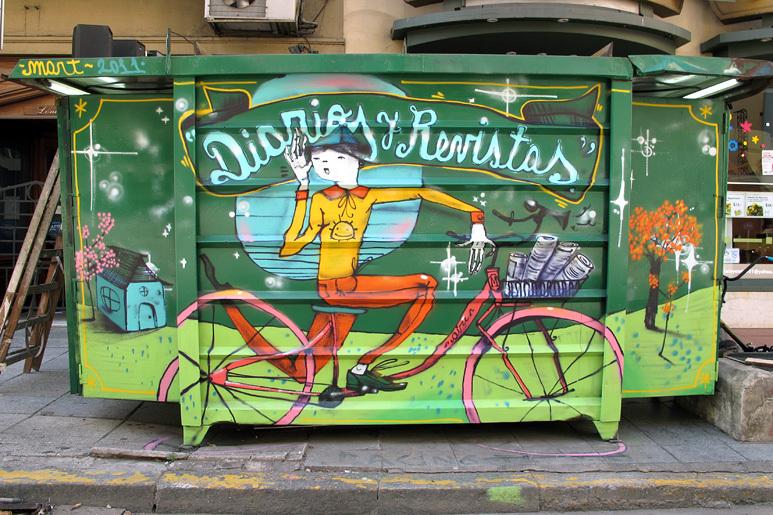 Riding through the streets is one of the best ways to get to know the barrios of Buenos Aires. Cycling around gives you a different perspective on the urban walls, and is a great way to explore and find hidden street art pieces. 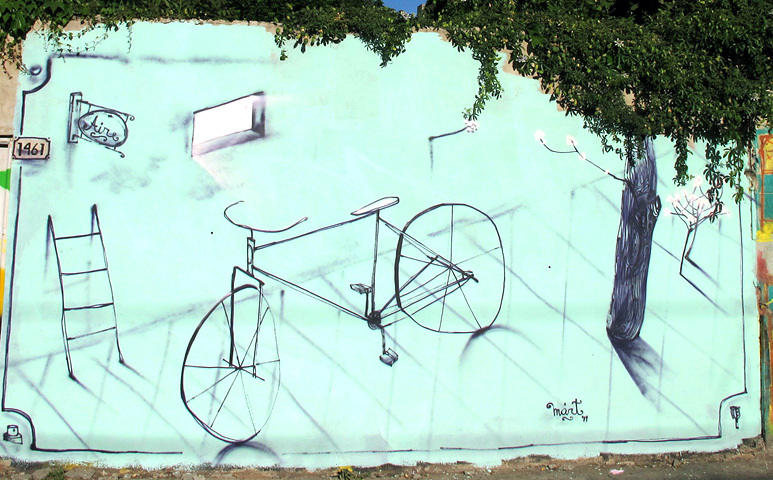 Many of the artists rely on their bikes to help them scout out new walls to paint. Some artists like Gualicho even take their paints with them as they cycle, so that they can start work straight away whenever they find a good spot. For those interested, the graffitimundo bike tour lasts about 4 hours and is $35 USD for the tour, bike & helmet hire and refreshments. We take a leisurely ride around some of the lesser-known spots in Palermo before heading up to Villa Crespo to see fresh pieces by artists such Mart, Jaz, Zumi, Ever, Nasa, Nerf, rundontwalk & Stencil Land to name but a few. As with all our tours, our close relationships with artists and intimate knowledge of the scene allows us to reveal the stories behind the art, the different styles and techniques on display together with the cultural and historical context of the movement. The tour is run in collaboration with the Biking Buenos Aires crew, who keep everyone safe on the road, maintain the bikes and make sure we’re topped up with water, maté and biscuits. For more images of the tour, the Travel Chica has some great shots on her blog. Just shoot us a mail if you’d like to join us, a shiny playera bike and the colourful stories behind the walls await.